In a truly rare event, my interview notes were released to the public resulting from a FOIA order granted by a Michigan state judge. Due to this release you have a rare opportunity to see how the principles that I teach in my Advanced Interview Techniques classes play out in a real investigation. As this is still an active federal investigation I cannot comment further on the case. A reading of this Detroit Free Press article should be sufficient for now. After the investigation has concluded as well as all legal proceedings, I will put together another course about this investigation into how city agencies in Detroit Michigan administered nearly $500 million of federal funds to tear-down nearly 70,000 blighted homes in Detroit. The FBI has reviewed a report that suggests bid-rigging and collusion among Detroit demolition officials and contractors, documents obtained by the Free Press show. Contractors’ bids to tear down Detroit’s blighted homes were manipulated, the documents say, as part of a scheme concealed from state overseers yet known by Dave Manardo, Mayor Mike Duggan’s group executive for operations. The mayor’s office Friday disputed that Manardo knew of the bid manipulation scheme and downplayed the documents’ significance, saying issues they raised already have been resolved with the state. The FBI also was given information about several other red flags, including a $1.3-million demolition contract that an investigator believed was “greased” for Adamo Group to win; possible collusion between demolition contractors and asbestos survey companies, and an 800-square-foot garage that inexplicably cost $22,250 to tear down. The documents — originally compiled by investigators hired by the state before they were turned over to the FBI — also include notes of interviews with Detroit demolition officials whom a lead investigator described as evasive in their answers. One state investigator suspected illegal activity during the review, according to his interview notes. “My theory is that bid-rigging practices have inflated the cost of demos,” lead investigator Tom Golden wrote in notes taken in July 2016. Golden, a retired PricewaterhouseCoopers partner who specializes in forensic accounting and fraud investigations, was part of a team hired by the Michigan Homeowner Assistance Nonprofit Housing Corp. (MHA) to investigate the Detroit demolition program’s use of federal money. 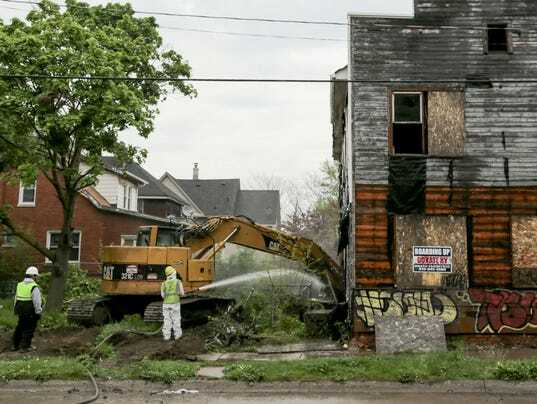 The MHA, which oversees federal funds available for Detroit demolitions, began its review of the city’s blight demolition program in late 2015 as costs skyrocketed and media scrutiny increased. Overall, the state’s investigative report provides an unforgiving, troubling assessment of Detroit’s demolition program. The report also opens a window into what federal investigators are examining as part of their ongoing criminal investigation of Detroit’s blight demolition program. The status of the federal probe is unclear. Duggan spokesman John Roach said in a statement Friday that problems uncovered by the state’s investigation were resolved last year in a settlement with the state. As for Manardo: “Auditors’ initial concerns were not substantiated after a full investigation. … Dave Manardo has Mayor Duggan’s full confidence,” Roach said. “While these documents may offer a new look at some of the activities taking place before the (state settlement), there isn’t anything here that the city, MHA and Treasury already haven’t addressed and you and other media haven’t reported,” Roach’s statement reads. The state’s investigation caused U.S. Treasury to suspend the city’s demolition program in the fall of 2016, Roach said. Since then, oversight was strengthened and another $42 million in federal money was released for the program. The Free Press obtained the state’s investigation and related documents via a Freedom of Information Act request. The MHA, the state agency that commissioned the investigation, has acknowledged the report was turned over to the FBI and SIGTARP, a federal law enforcement agency involved in the probe of Detroit’s demolition program. While the mayor’s office expressed confidence the issues have been resolved, a state official familiar with the report said she hasn’t heard how it was received by the FBI. The MHA doesn’t have the resources to prove whether bid-rigging or collusion definitively occurred, Townley said. She said the state embedded staff within the Detroit demolition program and put other controls in place to make sure problems identified in the report do not happen again. Government watchdog Robert Davis, who sued the MHA last year for access to documents related to the state’s investigation, said he believes the state was withholding release of the documents until after Detroit’s mayoral election last November. Townley said she is not involved in FOIA requests the MHA receives, and the agency does not discuss those requests with the City of Detroit. About $258 million in federal money has been earmarked for Detroit’s blight demolition program. Of that, about $144 million has been spent. The state’s investigation indicated that Manardo — Duggan’s group executive for city operations — was aware of a demolition bid manipulation scheme that was deliberately concealed from state overseers. The city admitted early last year that contractors’ demolition bids were manipulated to avoid a $25,000 cap on per-house demolition costs. Records of the state’s investigation show for the first time that investigators were told Manardo was aware of the scheme as it happened. Manardo, who previously worked with Duggan at Detroit Medical Center, managed the city’s demolition program as executive director of the Detroit Building Authority before moving to his current post in October 2015. Jim Wright, who has since left city government,was his deputy. As part of the scheme, contractors would shift demolition costs on bid sheets from houses that cost more than $22,500 to other houses in the bid package that cost less than $22,500 to tear down. The bid manipulation allowed contractors to subvert the $22,500 cap on per-house demolition costs while maintaining the same contract price. State investigators found 10 contracts in which this occurred. They were interested in which city officials knew about the scheme. Roach said the mayor’s office cannot speak to Wright’s statements. “However, auditors’ initial concerns were not substantiated after a full investigation, which again, included complete access to all DLBA and DBA computers and documents related to this issue,” Roach said in a statement. State investigators found several instances of demolition prices changing after a contractor won a bid. After reviewing documents involved in a particularly troublesome $1.3-million contract awarded to Adamo in 2015, Golden believed the company “was wired to get this bid in any case,” he wrote in his notes. Adamo, a Detroit-based demolition company in business for more than 50 years, has been a leading contractor in Detroit’s demolition program. Golden studied the bid documents and Adamo’s final contract. He also interviewed city demolition officials multiple times about the deal. “My theory was because it just didn’t matter what Adamo bid. They were wired to get 2Dall along,” Golden wrote in his interview notes. Contract 2D was flagged because investigators discovered a $250,000 mistake in the original bid. Adamo estimated it would cost $253,394 to tear down a single house on Tillman Street. But in the final contract, the demolition cost on Tillman dropped to $38,977, while the costs for nearly all the other houses in the 71-property package increased by exactly 25.9% — just enough to spread the original $253,394 cost among the other properties. Wright gave conflicting answers about the Adamo contract when quizzed by Golden in interviews in July 2016. At first he told Golden that Adamo was the lowest bidder among seven companies interested in the job. But Adamo actually was the highest. When Golden asked Wright about the changes in Adamo’s bid, Wright could not explain why city demolition officials didn’t catch the changes. Wright abruptly resigned from his city post without a severance package three weeks after his interview with Golden. Wright did not immediately respond to a message seeking comment. A lawyer for Adamo Group declined to comment. High demolition costs sometimes can be attributed to hazardous asbestos-containing materials inside blighted properties that contractors must remove prior to demolition. But the state investigators found that one Detroit demolition contractor in January 2016 charged $22,250 — about $10,000 more than typical per-house demolition prices — just to demolish an 800-square-foot garage that required no asbestos removal. The contractor, Rickman Enterprise Group, originally proposed a price of $4,260 to tear down the garage. Land Bank officials had few answers about the discrepancy for state investigators. Delgado and Bascos no longer work for the Land Bank. Delgado, who was a compliance grant manager for the Land Bank, left with little explanation in January 2017, about the same time Bascos, who was the Land Bank’s demolition director, resigned. Demolition contractors are given asbestos reports that allow them to calculate removal costs for their bids. For one Detroit house on Gable Street, Adamo estimated asbestos abatement would cost only $405. The asbestos survey Adamo relied upon for its bid was dated March 24, 2015. A few months later, a former Detroit demolition official named Aradondo Haskins contacted the asbestos survey company and said asbestos was found at the property. Haskins asked for a revised report to reflect the discovery. The company, PSI, obliged, changing the survey without updating the date it was issued. A change order for $7,900 worth of asbestos removal was then invoiced, the state’s investigation found. An e-mail exchange between Haskins and a PSI representative was included as an exhibit in the state’s report as evidence suggesting collusion between contractors and subcontractors, particularly asbestos abatement survey companies. Despite damning conclusions the state’s investigation reached, city and state officials have maintained for more than a year that the review found no proof of bid-rigging or any other criminal activity. The MHA’s investigation ultimately found $7.3 million worth of improper billings from the Land Bank. Most of the problems stemmed from “unit-price” contracts the city drew up in 2014 with input from a select group of demolition firms, including Adamo, Homrich and MCM. The audit found more than $4 million in ineligible payments under the unit-price contracts for backfill and nearly $1 million for asbestos work. A settlement ultimately was reached between Duggan, the MHA and its law firm, Holland & Knight, in January last year. The settlement called for the Land Bank to pay the MHA $5 million for a chunk of the improper payments identified in the audit and for the MHA to make available $5 million for Detroit demolitions. As part of the settlement, the Land Bank made no admission that $6 million worth of disputed billings were improper. But SIGTARP — the federal watchdog working with the FBI — told the state it was interested in the audit. SIGTARP requested in 2016 all of the work documents involved in the state’s investigation of the Detroit Land Bank. Townley, of the MHA, said those documents were turned over to the FBI and SIGTARP at or before a meeting in early 2017. Townley said the MHA decided to settle its claims against the Detroit Land Bank because doing otherwise could have been unfair to Detroit residents.